Most of the Mobile Repair Personnel search for the Nokia Firmware to flash Nokia Mobiles. So Don't bother about that here is the best way to download the all Firmwares. NaviFirm+ is all in one solution for Nokia Firmware just select the Phone Model and then the Firmware version or Releases then select the Variants then click on Download, your needed file like Ppm, Mcu, Content etc. for flashing will be download to the default directory (Drive:\NaviFirm\Fw). NaviFirm+ is a modded version of the NAVIFIRM tool developed by EPICBIZNUS, which can be download form Symbian-toys.com or search Google For NaviFirm. NAVIFIRM is the ultimate tool for downloading Nokia firmware files, you can get list of product codes, and finding the right product code for your phone. 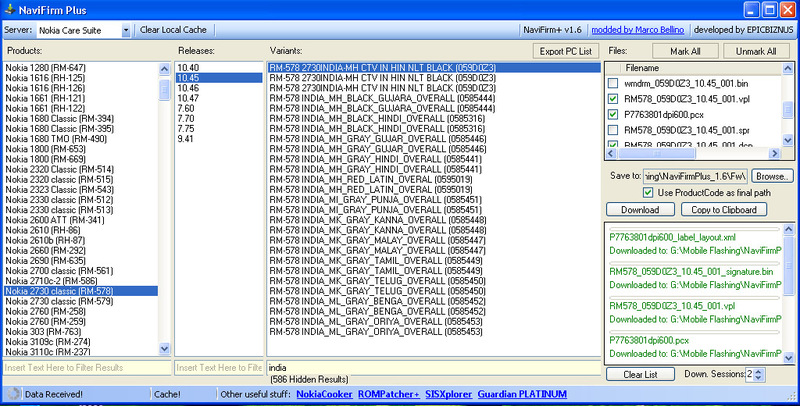 NAVIFIRM downloads all this firmware from Nokia servers. It works very slow, i think it need faster internet speed. You are right, at least you should have a broadband connection, otherwise it will be slow and the latest model of Nokia mobile phone has above 100 MB Firmware File to download.